I was drawn to this title because it deals with the Civil Rights movement. Fifty years have gone by since the pivotal events of that time, and now, as a second movement unfolds in response to the disproportionate jailing of African-Americans and out-of-control cop violence, it seemed like a good choice. 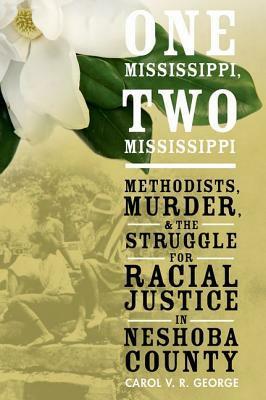 I have no particular interest in Mississippi as opposed to any other part of the USA, and absolutely no interest in the Methodist church, but I was willing to slog through the various ins and outs of church history in order to find the nuggets that were salient to the political struggle. Thank you to Net Galley and Oxford University Press for the DRC. I’ve rated this book, which reads as if it was perhaps someone’s thesis at some point, a 3.5 for general interest levels, but for those with a particular interest in Methodist history or the history of Mississippi, I suspect it would rate five stars. Methodists take great pride in having participated in the Underground Railroad prior to the American Civil War, and George takes the church to task for having failed so miserably in upholding this standard following Reconstruction. As Jim Crow laws became the rule of the south, Caucasian Methodists in Mississippi closed their doors to African-American worshippers, and the central church administration, after a certain amount of struggle, folded like a card table. Separate churches became the law of the land. Only in recent years has this changed, and even then, change has been slow. Neshoba County is of particular interest to Civil Rights scholars because it is there that the Freedom Riders, in addition to countless local black voters that opened their homes to Civil Rights activists and helped run the Freedom School, were murdered by the Klan and the cops; it was opened in the (black) Longsdale Methodist church to assist black voters in running the gauntlet of red tape and assorted obstacles through which its citizens had to pass in order to use the power of the ballot. In contrast to Longsdale, the Neshoba County town of Philadelphia is overwhelmingly Caucasian, and its vicious racism, along with that of most of white Mississippi, was a tough nut to crack. There has been progress made, but much work yet to be done. I was aghast to see that 96 percent of white Mississippians supported the continuation of Jim Crow laws, and it was because of their conspiracy to keep the Old South in entirely white hands that it was nearly impossible to bring the killers of the Civil Rights workers to justice. Only recently have its residents been open to change. The Choctaw Indians opened a casino in the area and in doing so created more jobs, and therefore more turnover in those that reside in Neshoba County, and this is partially responsible for recent progress. Should you go out and spend money on the hard cover book? I guess this depends upon how deep your pockets are, and whether or not you are interested in the history of Mississippi and of Methodism. I am glad I read it, although the recently re-released biography of Dr. King is unquestionably the definitive story of the Civil Rights movement. Still, for those that have the time and interest to read more than one book on the topic, and I hope you do, you could do much worse than to read this interesting study. I’m glad I did. This entry was posted in black rights, Civil Rights Movement and tagged black rights, Civil Rights movement, integration, Ku klux Klan, Methodist Church history, Neshoba County Mississippi, Voting Rights by seattlebookmama. Bookmark the permalink. Very thorough review on an important topic. Thanks for sharing.